There is something disconcerting about trotting out one's completely self-taught Spey casting technique in front of a 70-year old Irish ghillie in a famous Irish salmon stream. He's probably seen everything and certainly guided casters who knew what they were doing. But there I was, standing hip deep in the Blackwater, covering the water in the best way I knew how, basically treating it like the Trinity or American for steelhead. So far I hadn't thrown any really awful snarls. After about 25 minutes Frank said, in his barely intelligible Irish brogue, “You're covering the water really well. Keep working down to that tree on the other side.” I don't think I have ever been more relieved by a guide's words. I wasn't a complete bozo. I was actually doing it as expected, or perhaps better than expected, since this dumb Yank had already gotten lost five times on the way to the beat that morning. The Blackwater is a gorgeous tea-colored Atlantic salmon stream that meanders through the Irish countryside northeast of Cork, passing such places as Ballyhooly and Fermoy. Driving in the Irish countryside is an adventure; the Irish highway department (if it even exists) takes a very cavalier attitude toward directional signage. This beat was about a forty minute drive from the fabulous manor house hotel, Ballyvolane House, when done correctly. I had taken about an hour and a half, and had I not had a cell phone with me, I might well still be wandering the back roads of County Cork. Ballyvolane House is one of the “Great Fishing Houses of Ireland” found on a website of the same title, www.irelandflyfishing.com . 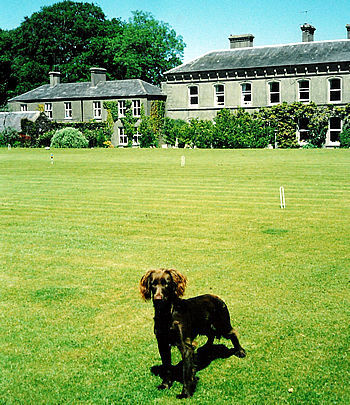 This hotel is run by Justin and Jenny Green in a manor estate that has been in Justin's family for several generations. Justin's parents, Jeremy and Merry, started the hotel and fishing business, and Justin has taken it over. The accommodations are lavish, with a sumptuous, cooked-to-order breakfast included. There is an optional prix fixe dinner available each evening, which feels more like an elegant dinner party than a restaurant. The dining room has a long table that seats 16 -20 people and provides an opportunity for interesting conversation with people from around the world. While Jeanie and I were there we met folks from South Africa, England, Ireland and various parts of the US and Canada. About half the guests were there for the fishing; others to enjoy the countryside and the grounds of the estate. 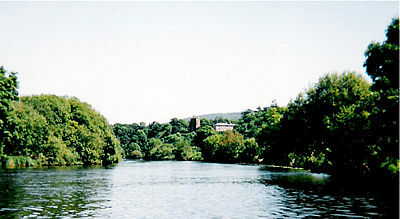 Ballyvolane House has access to a number of beats on the Blackwater and other rivers in the area for both salmon and trout, as well as some trout ponds on the estate property. They can provide equipment if needed and have contracts with ghillies to guide on the beats. Prices are quite reasonable. For salmon an Irish National license is required. A twenty-one day license costs €23 (about $28). The access to the salmon beats is €80 and a ghillie will run about another €50. This is comparable to a day with a guide on most of the California rivers, and considerably less than the prices on some of the fabled salmon streams of Scotland and England. The fly fishing for salmon in Ireland is done with two-handed rods. This seems to be the expected method, although there is nothing illegal or unethical about using a single handed 8-wt. It is simply the way it is done, and the long rods are much better at handling big fish. The Blackwater salmon are often bigger than 12 pounds and can go over 20. 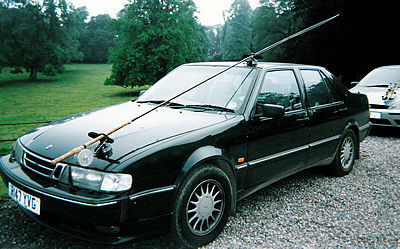 Some beats allow spinfishing, others are fly only. All of the fishing guests at Ballyvolane during our stay were flyfishers. There was a couple from Sussex who come every year for a week in June, another guy from Essex who was just trying out his first salmon rod, and another chap from East Anglia who went out each day in breeks (plus-fours) and a tie, although he did not wear a jacket to dinner. The Blackwater felt very much like a slightly slower, tannic-stained Trinity River. The water is very clear, but with the distinctive tea color caused by percolation through peat. The casts required were from thirty to perhaps a hundred feet, depending on the conditions. It was interesting that unlike in the US the use of the two-handed rod is not confined to long casts on wide water. There were many instances when I was making pretty short casts, and using the rod's length to control the drift. Once I got the hang of it, the Spey rod was very comfortable for this type of fishing too. It has the advantage of not needing a back cast in tight quarters, and your fly is in the water, where the fish are, a lot more of the time. The casting techniques to successfully put your fly where you want it are the Snap-T, Snake Roll, Single and Double Spey casts, although the first two can substitute for the single and double for all but the farthest casts. The fly presentation is the standard downstream swing that we use here for steelhead, but salmon fishers use a floating line exclusively. They expect the salmon to come up to the fly. The flies used on the Blackwater are small, size 8 or 10. Unlike steelhead flies they are often tied on double or treble hooks that would be illegal in many North American waters. The Frank's beat had a narrow fast section and a longer broad pool that was overlooked by a large castle towerundefinedan exquisite view to add to the fishing ambiance. I had the whole thing to myself although each beat can accommodate two rods. Frank and his assistant, Bob, were a real pair. I had been warned that they were difficult to understand and a bit salty. One thing that helped was that you only needed to understand half of what they said, because every other word was an expletive, usually some grammatical variant of the f-word. Nonetheless, Frank had been a ghillie and the riverkeeper for this stretch of the Blackwater for over most of his life. Bob was younger, had a “real job” on the docks in Cobh, and looked to be the successor to Frank, who was getting a little old for the heavy lifting required in riverkeeping. Between them they kept up a constant banter, providing entertainment, guidance and encouragement. In addition Bob brought along his two Jack Russell terriers, Sally and Jack. Bob told me that Sally wasn't allowed down to the river often because she would catch and kill too many pheasants. That day she spent her time chasing Jack around and adding her own words of encouragement, without discernible expletives, to the caster. Periodically she and Jack would raucously warn of the potential of an interloper on the road several hundred yards away. 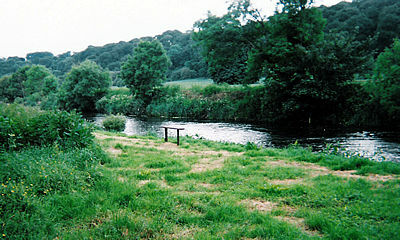 Riverkeeping in Ireland and the UK is a sort of private-enterprise fish and game department. The Riverkeepers serve as game wardens, environmental monitors and habitat restorers for their stretches of water. They maintain the fences to keep the cattle out of the river, clear the dead branches and snags that come down in the floods and maintain the gravel beds for the spawning salmon. They are generally employed by the owners of the river beat or by the fishing associations that are responsible for a particular portion of the stream. Fishing is controlled by these private owners or associations, rather than the state. With the exception of the national salmon license, fishing is by permit from the local person or organization responsible for the particular stretch of water. In most cases this is a very nominal fee, perhaps 5-10 euros ($6-$12). My first day on the river was punctuated by a hit here and there. At one point early on I had a substantial grab and like any rookie, I completely missed. Late in the afternoon I rolled a big salmon, but try as I may I could not get it to make a second pass at the fly. I finally gave up and headed back to the manor for the evening meal. On the way home I only had one directional mishap. Coming to one of the intersections that I had successfully negotiated that morning, I discovered that it was not a mere crossroad, but rather a five way roundabout. 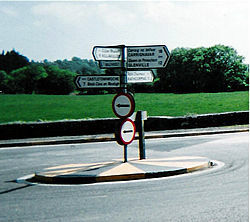 Unfortunately the directional signs in the middle only indicated four directions, and the way to Rathcormack, where I wanted to go, was the one direction with two possible roads. I hadn't noticed this in the morning. I flipped a coin and chose one. Of course it was wrong. Fortunately the road became recognizably wrong within the first two miles, so my digression didn't take me too far out of the way. Upon returning to the hotel I found that no one else had caught any salmon either, so it felt a lot like a Trinity River steelhead fishout. Now for the great food and company. 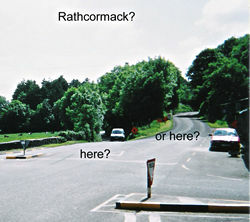 The sign says "Rathcormack that-a-way..."
...but there are two "that-a-ways"
The next day I found that the ghillie on the next beat that I was to try was not available. I could have flown solo, but considering my previous adventures just finding the river, I decided my chances of success were much better if I were to return to Frank's beat and try it again. There had at least been fish there, and I knew where they had beenundefinedand I knew I could find the place again! Unfortunately, I had no luck at all. The fish appeared to have moved on. I had another beautiful day, on beautiful water, listening to more stories from Bob, enjoying the antics for Sally and Jack, but no fish. Man, can I cast that Spey rod though!